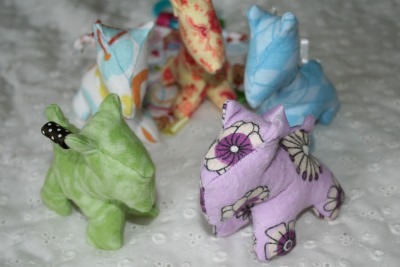 This post use to contain a bit of information regarding some simple plush toys I made for my son. I am forced to take the info about them off my page. KidsII claims a patent for any looped ribbon sewn between two peices of fabric. It makes me wonder how many people work in their legal department, and how many hours a day they spend sending out infringment letters to the many mothers in blog-land who have made these types of toys for their children. Anne, the colours and patterns in the fabric you have chosen are great. I really love that you have taken the lead on this project from Rowan. Tags and boxes for kids are so often the unintended object of their play. Great observations, mom. Just one word of caution. Years ago some of the extras like ribbons and small bells etc were taken off toys for babies this age because of the concern for swallowing them if they came loose. I know you are aware of that and will attach bells very carefully and strongly. Thanks for the safety comment, Avis! I'm going to edit my text ASAP. The bells are inside the 'giraffe', but I didn't make that clear. Fantastic work Anne - they look marvelous! Out of curiosity, what kind of sewing machine do you have? Sewing I can do... but I've yet to get my own machine. I have a Husqvarna from the 1990's that belonged to my mum. It's a fairly simple machine, but I like it because I know how to use it :) Mum now has a Pfaff (purchased locally...but I forget the name of the lady who sells them in your area) which I had the pleasure of trying over the holidays. Ohhhhh boy!!! THAT'S a sewing machine! Heads up, a good sewing machine is not cheap! But if it's something that you'll use a lot, it's definitely worth the investment.